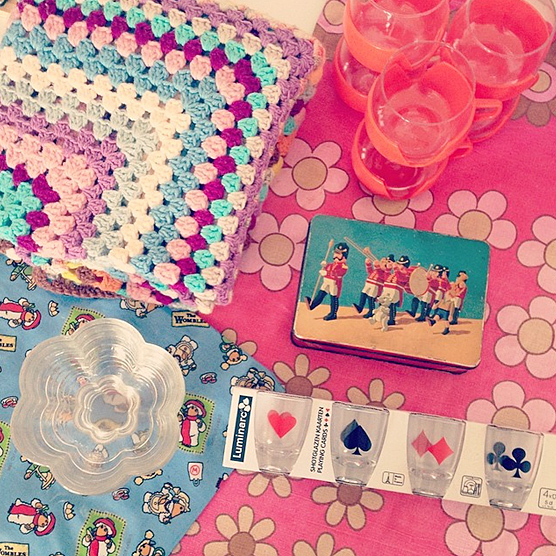 A colourful selection of fresh vintage finds! This week’s mini shop update is full of summery candy colours and items you can use when the sun comes out to play… I imagine using the 1970s orange coffee cups for gin and juice on a light summer’s evening. The glass daisy shaped dessert dishes are ripe for ice-cream, fruit and oodles of sprinkles. The crochet blanket and cotton floral tablecloth can be used for picnics and garden parties. The 1950s toy soldiers tin can double as a lunch box and carry your sandwiches or homemade flapjacks to the park. Yup, Summertime is most certainly on my mind.